The baby is expected at the end of the year ! Re: Princess Charlene is pregnant ! Wonderful news. Congratulations to them both. An heir. Great for Monaco. Its about time. She doesn't look comfortable in the first picture. Great news. Was always a matter of time, we know for definite Albert does not fire blanks. On a snarkey note, Caroline must be spitting daggers that she is no longer going to be the Heir. Oh, boy! I saw this flash across the news channel and was super happy which surprised me. This should be great to follow. Congrats to the couple! But equivalent with the age of the man there is risk of enheriting gene malfunctions. Because the sperm is produced with an increasing amount of defects, the older the man gets. A test also have shown that children with young fathers are prettier than children with old fathers. Again gene malfunctions can actually be seen in the face. Hey! The turkey baster worked! Congratulations to them good to see that shes not letting her pregnancy stopped her from working. At her age, its not going to be easy. Monaco's Prince Albert II and his South African wife Charlene are expecting their first child together, they announced today. The 36-year-old South African former Olympic swimmer and her husband, 56, issued a statement through the royal palace expressing their 'immense joy'. Or they were trying the natural way, would explain the miserable look on her face! She could have opted for a hood! LOL! Caroline must be having nervous fits; she has been looking at herself as Heir, since forever, then suddenly Albert marries and is now going to have a child that will displace her and her spud from inheriting the throne. 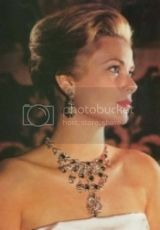 No Princess Tatiana of Monaco, no Prince Andrea of Monaco, and now Caroline will be sidelined. So now Caroline will have to build a new life for herself based on something other than waiting for Albert to drop dead. If Albert does drop before the kid is eighteen, then Charlene will be in charge and I wonder just how difficult Charlene might end up making Caroline's life if Caroline tries to push her around. Charlene will be Princess Regent, working with the councilors and chances are Charlene will be better at dealing with any drama Caroline dreams up. This comes as such a pleasant surprise and I wonder if whether or not Charlene will have more than two and start to cheer up more. Does it matter if the baby is a boy or a girl?